There are numerous problems that affect our feet and many more solutions. The most important factor for treatment is to use the most appropriate treatment plan for each individual case. The use of foot orthoses (also known as inserts or orthotics) may be a part of the treatment plan for some sore feet. However, before jumping into foot orthoses, it is essential to ensure that the mechanics or physical structure is part of the problem. When foot pain strikes, the first step in the treatment plan is to visit a professional who can conduct any necessary tests in order to establish the diagnosis, and then a treatment plan can be established. 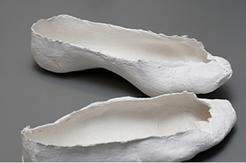 Custom made orthoses are made to the individual foot, usually from plaster impressions. The foot is casted with Plaster of Paris to produce molds and the molds are taken to the laboratory to use in the manufacturing of the foot orthoses. The foot orthoses are fabricated from a variety of materials, again depending on the individual client. In general, a softer material is used for cushioning and protection such as for a person with rheumatoid arthritis or diabetes mellitus. A firmer material is used for a foot orthosis that will control motion and foot position for pathologies such as plantar fasciitis or tibialis posterior tendonitis.